While The Legend of Zelda: Breath of the Wild, might be the first Zelda game you play on your Nintendo Switch, it is no means the only Zelda themed game you can play on the hybrid console. 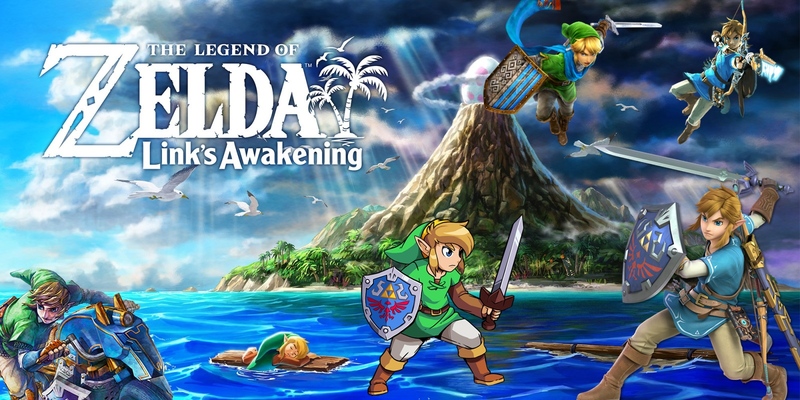 In fact, in addition to the re-imagining of The Legend of Zelda: Link’s Awakening, which is due out in 2019, we also have two Hyrule games in the form of Hyrule Warriors: Definitive Edition, which is out now and the indie crossover that no one saw coming, Cadence of Hyrule, which is also due out in 2019. In light of heavy presence on Switch, for those of you who are unaware of the other games, or just new to Zelda entirely, but own a Switch, then consider this guide your doorway to the many adventures you can have in Hyrule. *All game descriptions, information & screenshots come directly from Nintendo. Cut down enemy hordes as Legend of Zelda™ characters—in full 1080p TV mode—or in two-player on one system! Link and Zelda can battle in costumes from the Legend of Zelda: Breath of the Wild game, while Tetra and King Daphnes appear in scenes based on the Legend of Zelda™: The Wind Waker game. Find and care for fairies who will aid you in battle! All features and downloadable content from past versions of the game, including My Fairy mode and elements from The Legend of Zelda: The Wind Waker, can now be enjoyed in crisp HD on the Nintendo Switch™ system. This time, you won’t face the dark sorceress, Cia, alone. Command legendary heroes and villains in battle to achieve objectives as you unleash special attacks. Advance the story to unlock characters, each with their own moves and weapon types. Collect rupees and other items to upgrade weapons and craft badges, which bolster your warriors’ abilities. The fate of Hyrule rests in your hands! In this modern re-imagining, players travel to the mysterious island of Koholint to guide Link on a perilous adventure. The Legend of Zelda: Link’s Awakening arrives exclusively on Nintendo Switch in 2019. Battle on new courses, like Urchin Underpass and Battle Stadium, or returning ones, such as GCN Luigi’s Mansion and SNES Battle Course 1. Winner of 200+ Game of the Year Awards, Skyrim® arrives on the Nintendo Switch™ console. The open-world adventure from Bethesda Game Studios® where you can virtually be anyone and do anything, now allows you to go anywhere—at home and on the go. New features include motion controls, gear based on the Legend of Zelda™ series, and amiibo™ compatibility. Live another life, in another world—from battling ancient dragons, exploring rugged mountains, building a home, or mastering hundreds of weapons, spells and abilities. For the first time ever, go into battle Legend of Zelda style: fight with the Master Sword, guard with the Hylian Shield, while wearing the Champion’s Tunic. The game also includes official add-ons—Dawnguard, Hearthfire, and Dragonborn. Live another life, in another world and create your own custom character, and do virtually whatever you want. Raise Some Hell – Ages ago, angels and demons birthed your world in a forbidden union. Now they’ve come to claim it. Stand tall among Sanctuary’s meek and wicked to battle walking corpses, horrifying cultists, fallen seraphs, and the Lords of Hell. When the High Heavens and the Burning Hells war, humanity must be its own salvation. Unholy Trinity – The Diablo III game, the Reaper of Souls expansion, and the Rise of the Necromancer pack are all part of the Eternal Collection: 7 classes, 5 acts, and seasons’ worth of demon-smashing. Nintendo Switch™ Exclusives – Discover pieces of Zelda’s world in Sanctuary. The Eternal Collection on Switch™ includes the Cucco companion pet, a Triforce portrait frame, and an exclusive transmogrification set that will let your heroes sport Ganondorf’s iconic armor. You’ll also receive unique cosmetic wings. Defy the Darkness – You’re a surrounded world’s only defense against Heaven and Hell. Arm yourself with a Joy-Con™ or the Pro Controller, and choose from 7 dark fantasy classes, each with its own way to slay. Eternal Replayability – Evil is never vanquished forever. Whether you’re testing yourself against new difficulty settings, playing through the epic story campaign, searching for the perfect skill combo, expanding your collection of gear, racing through random dungeons, or traveling Sanctuary anew each season, you’ll always have a fresh challenge to seek out. Assemble the Perfect Arsenal – As you charge through Diablo III’s five story acts, you’ll collect gear from Sanctuary’s furthest reaches, including legendary items that change your entire playstyle and armor sets that provide dynamic bonuses as you uncover more pieces. Your Path to Power – Diablo III’s power-building system is flexible enough for an afternoon or a full season. Push back the Burning Hells with spears, storms, and zombie dogs—over 800 unique abilities to unlock and master. Turn fire into lightning, split your magic blasts, and change your skills to create devastating power combinations. It’s Dangerous to Go Alone – Jump into local, action-RPG multiplayer with up to three friends, and crush demons from your comfiest couch cushions, no internet required—or fill out the ranks of your party online. You can play Diablo III shared-screen on a single Nintendo Switch™, remotely on up to four Nintendo Switch ™ consoles, or combine TV and handheld play. Honorary mentions go out to both Bayonetta games, which include multiple Nintendo IP outfits, including Link’s green tunic, to Phantasy Star Online 2: Cloud, which features a Breath of the Wild themed Link, Monster Hunter Generations Ultimate and of course, The Legend of Zelda, Zelda II and their SP versions that are all available via the Nintendo Switch Online library of NES games. As always, we hope you found this guide helpful and hope to see you again soon when we update this guide with any and all new information that comes.